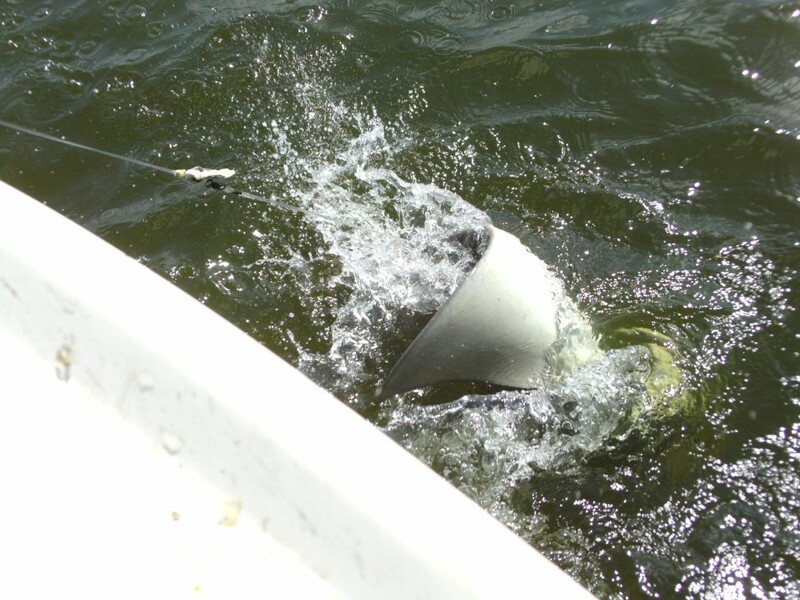 Summer of the Shark: Back to the Pamlico – Ya Like Dags? 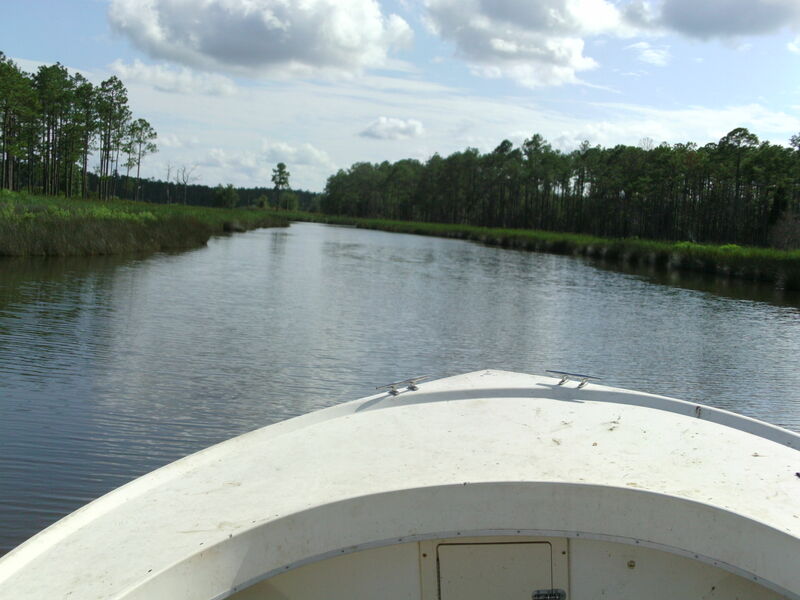 Tuesday saw Evan, Andrea, and I head back to the Pamlico River to cover it with the longline (you can see why it was missing last time here) in my brave/foolish attempt to see if there are any sharks in the Pamlico Sound. 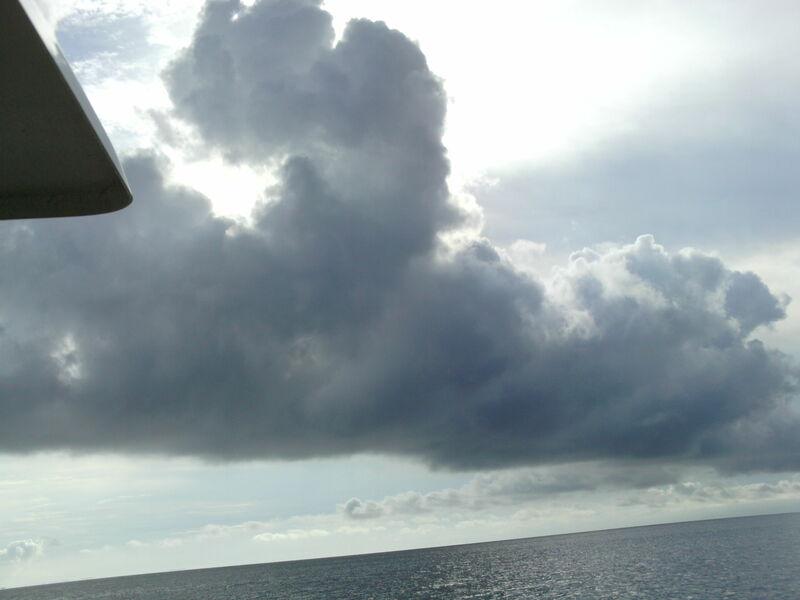 Weather-wise, we had a completely opposite experience from our previous trips out. But the important thing is: did we catch anything? Read on to find out. This trip actually managed to go off without any minor disasters, which was nice. The weather helped for a change. It was just cloudy enough to take the edge off the sun, and the temperature was down to a balmy 87 F. The sky was clear enough to see the only actual rain cloud from miles away, and we were able to skip around the edge of it and only take a light drizzle. All 50 hooks were available on the longline and we already had plenty of bait, so we even managed to get out on the water at a decent hour. With all that working for us, how did we do? Let’s look at it photo essay style. It was this nice out. Field days this good happen in North Carolina once every three years, tops. I don’t usually take a lot of pictures of clouds and landscapes, but this cloud looked absolutely Biblical. Good omen? 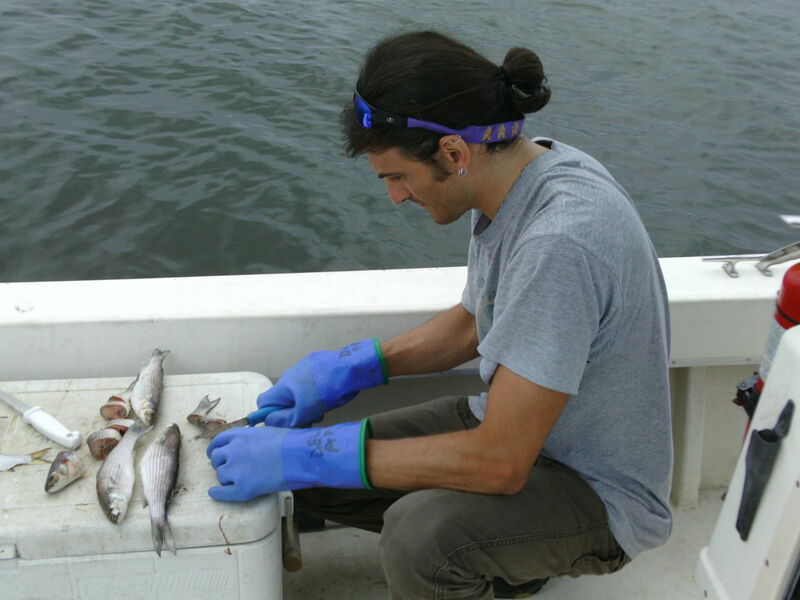 After spending a lot of his time tending to the acoustic array, Andrea was thrilled to get back into fish guts. Andrea and I demonstrating how the longline is supposed to work. 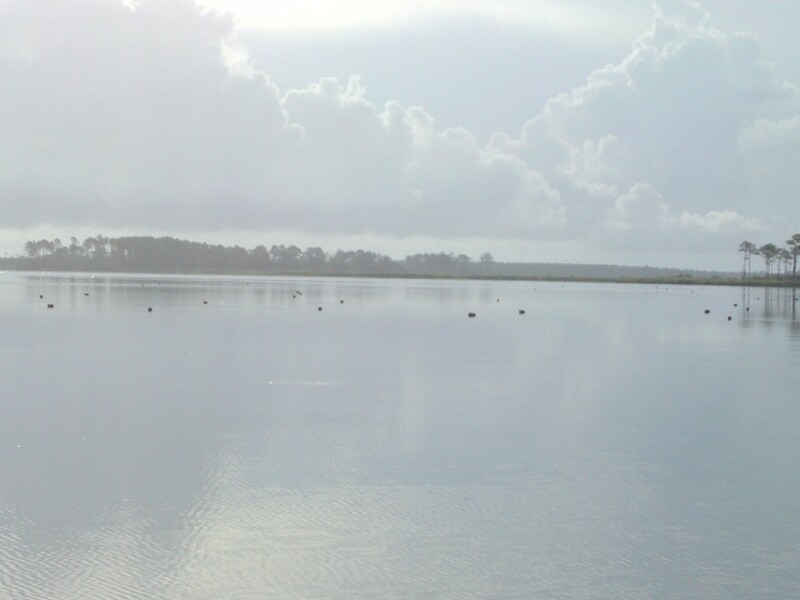 That dark patch of ripples is a decent-sized school of menhaden. 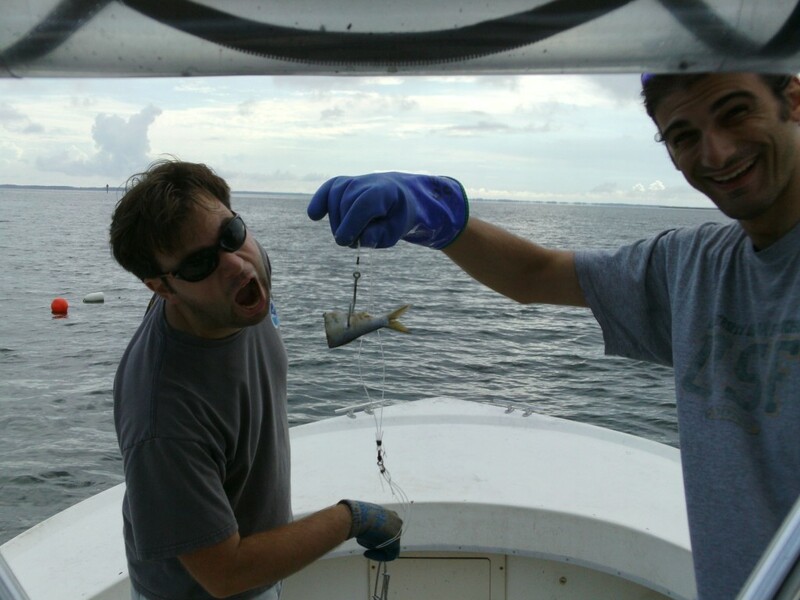 There were a lot of these moving around our sites, a good sign when you’re fishing for things that eat a lot of menhaden. 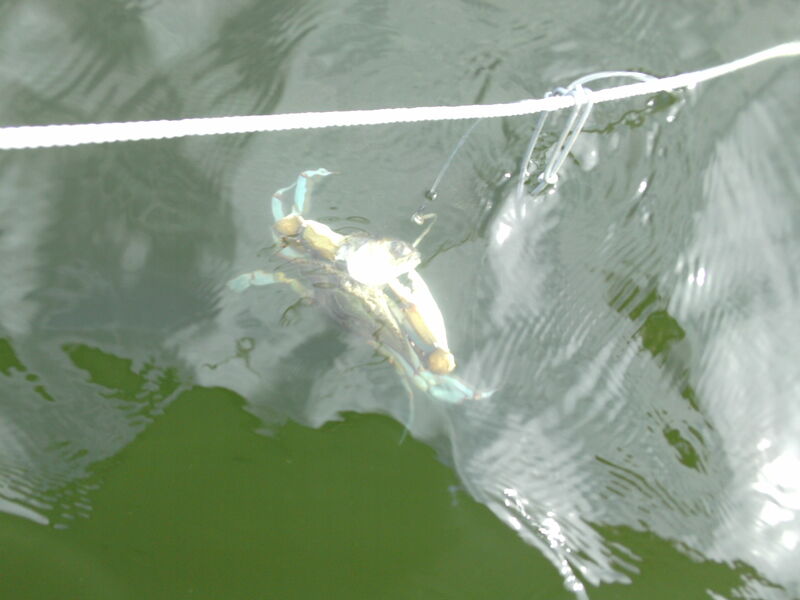 Just because the gillnet wasn’t in play didn’t mean we still weren’t running into blue crabs. Some of them, like this one, were real monsters. By the end of the day we got pretty good at flipping them up into the boat before they could let go. 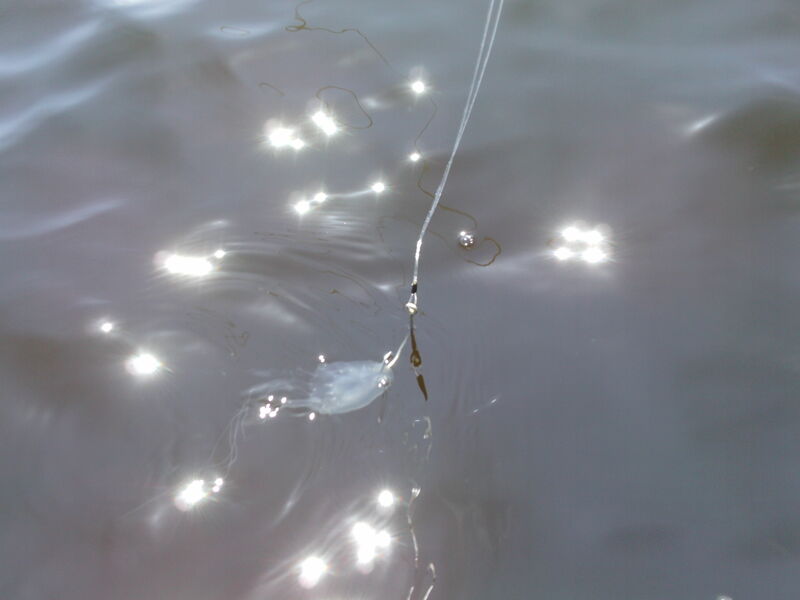 At least with the longline we couldn’t possibly get any jellyfish, right? 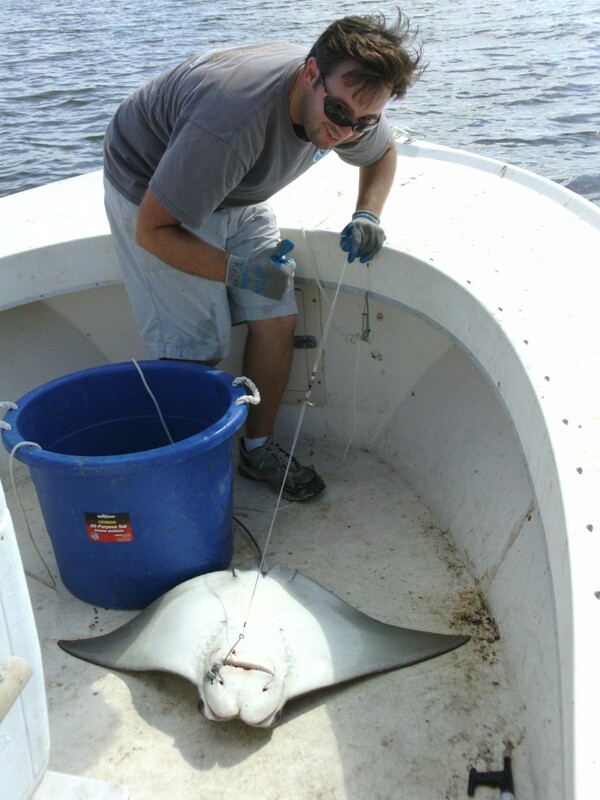 Just in case you thought we didn’t get any big fish, we managed to get a good-sized cownose ray. The wingspan on this big guy was just shy of three feet. The ray was actually so mellow on the way up that I was convinced we hadn’t actually hooked it and it was just hovering around the line. Then we got it alongside the boat and it flipped out. In the process, it proved that Evan can take awesome action shots of fish. We had to bring it aboard to take measurements. Fortunately tonic immobility works on rays too. Obviously I’m very excited to finally catch an elasmobranch. One of the very few days this summer where a day has both started and ended nicely. So no true sharks yet, but we’ve gone from getting a very shark-like bony fish at Hatteras to a fairly large actual elasmobranch in the Pamlico River. We’re working our way up, and perhaps more importantly we’re getting very good at setting the gear. The good weather really helped, and we only had to fight wind at one station. Next up: we try our hand at a little night fishing. 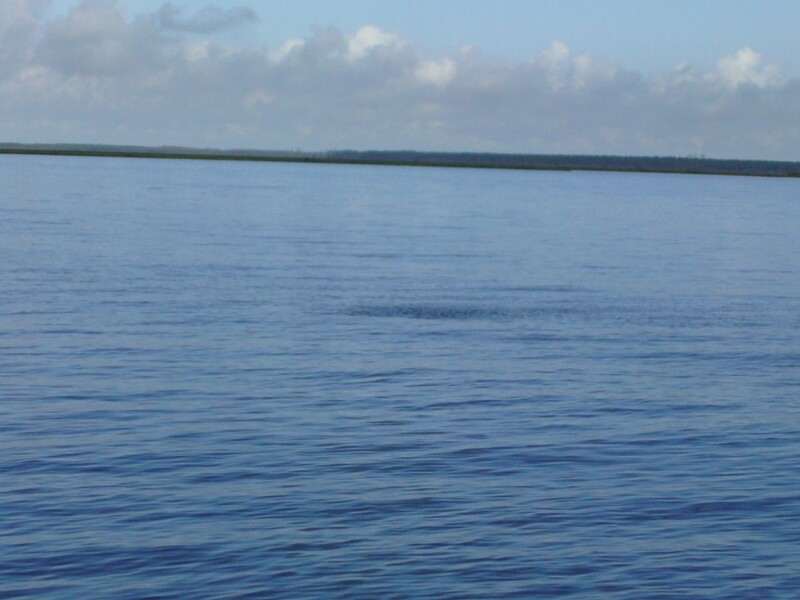 There was rumor of sharks caught at the mouth of the Pamlico River, just past Woodstock Point on Saturday, August 11, 2012. Any truth in that? We’ve checked around the mouth, but not precisely at Woodstock Point. 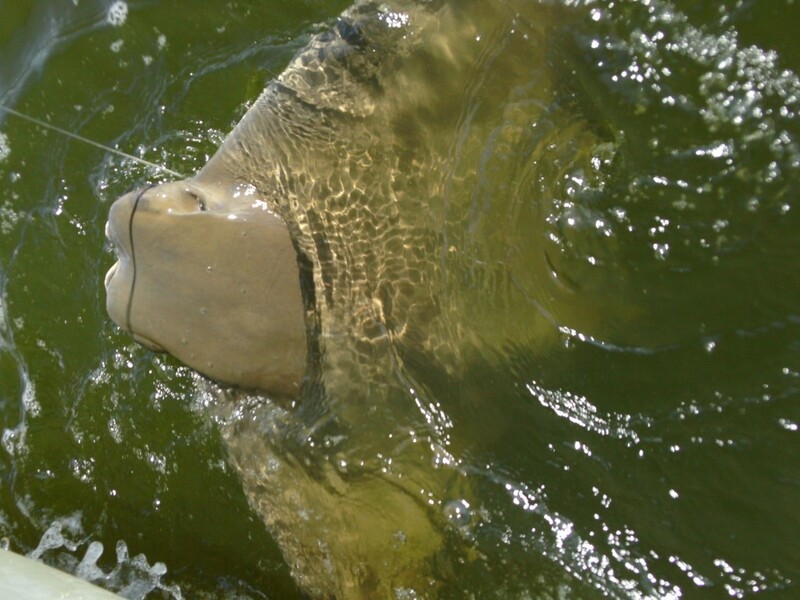 We tend to check out sites where fishermen and state managers have run into sharks before, but whether we actually get them is a different story.